We are here for all your automotive necessities after you purchase your new or pre-owned vehicle. We are more than your car dealer. 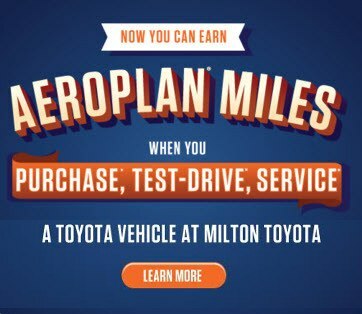 At the Milton Toyota Service Centre we can help keep your new or pre-owned vehicle running at peak performance. Toyota Service Advantage + is a commitment to providing an exceptional service experience. Not only do we offer competitive pricing, we also offer a long list of customer conveniences that will enhance your ownership experience. Who is better qualified to service your Toyota than a Toyota factory trained technician? 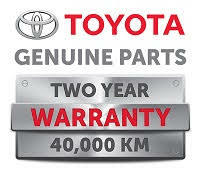 What better parts to use in your vehicle than Toyota Genuine Parts? Participating Toyota dealers have "Just the Facts" boards displayed in the Service department which highlights price and convenience unique to Toyota Dealers. Competitive mystery shops are conducted twice annually to ensure that you receive the best value for your dollar. The plus is the many amenities and value added services that our dealerships provide for your convenience and satisfaction. 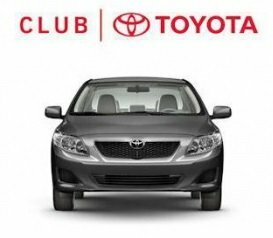 Bring your Toyota in to us and experience the advantage for yourself. 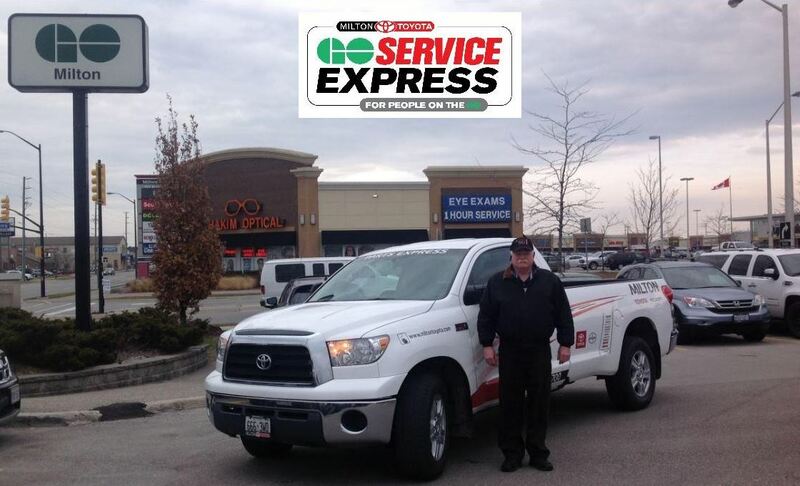 In partnership with GO Transit, Milton Toyota has introduced a new time-saving pickup service. We know you have things to do and trains to catch, so we're offering a convenient way to service your car. Go Service Express.We simply ask you to book appointments and advise what time you will be at the GO train. Please provide a cell phone number. At time of appointment confirmation, we will also provide you with our shuttle telephone number. Toyota's Express Service is all about meeting, then exceeding your expectations. 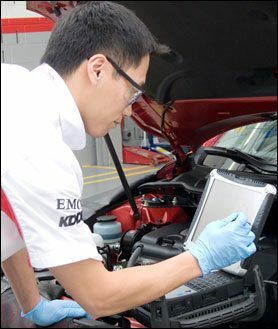 Imagine the convenience of having all your necessary maintenance done under one roof, performed by Toyota factory-trained technicians using Toyota Genuine Parts, while providing a time commitment that fits your schedule.We are committed to getting you safely back on the road as efficiently as possible. Make an appointment or simply drop in and our expert Service Advisor will customize a service according to the mileage of your vehicle. 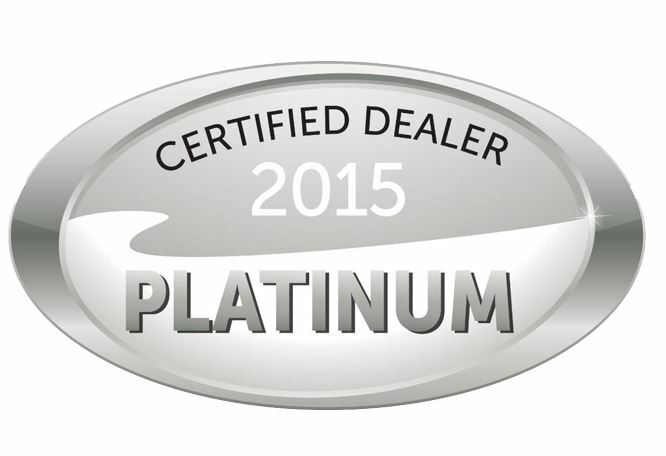 Congratulations to Milton Toyota for achieving TSM Platinum certification status as awarded by Toyota Canada Inc. Whether you're travelling to your corner store, through the United States of America or the rest of Canada, our Extra Care Roadside Assistance Representatives will assure your peace of mind motoring. If you are looking for any automotive part or have any questions regarding parts for your vehicle please contact our parts department. Find the right tire for your Toyota. The philosophy behind Toyota Quality Service is the provision of accurate, efficient and reliable servicing at every Toyota Dealership in Canada. To achieve this, Toyota service specialists undergo extensive training. All Service Advisors in Toyota Dealerships are exposed to a systematic three-step training program which focuses on customer care skills, service management, and product and technical knowledge. Successful completion of each level of training results in certification of the Service Advisor. This certification is recognized by Toyota Canada Inc. and Toyota Motor Corporation. All Toyota Technicians go through a training system called "TECSMART" (Technology, Excellence, Consideration of the Customer. Skills, Management, of Automotive, Repair Teams) in which they are categorized according to their skill level, and given appropriate training for that level of skill. Once the required technical skills have been mastered, technicians write factory-authorized Certification Exams. Upon successful completion of each level, they are presented with certificates and badges denoting their stature... Technician, Pro Technician, or Master Technician. All Toyota Dealers who sell and service hybrid vehicles have been specifically certified as hybrid Dealers. As part of the certification process, on-staff Toyota Technicians—who must already be accredited as either Pro or Master Technicians—undertake extensive training on hybrid technology. Certification also requires that the Dealership invest fully in the appropriate tools and technologies essential for the proper servicing of hybrid vehicles. The ultimate goal is to ensure complete satisfaction with your hybrid's performance and your service experience. Toyota is committed to developing technologies to ensure that you derive optimal enjoyment from your vehicle. Campaigns conducted by Toyota can be Safety Recall Campaigns and/or Limited Service Campaigns. Certain Warranty Enhancement Programs may also be applicable to your vehicle. Why is my air conditioning is not cold?